Comments: Obi-Wan arrives on Geonosis just as the Separatists pledge their support to Count Dooku. The Jedi is there as part of his investigation into the clone army's creation, and accidentally uncovers the movement's existence. He also discovers the huge droid manufacturing facilities on the planet and their dark purpose: to build a massive army for the Separatists to use in their quest to overthrow the Republic. Kenobi manages to relay this information before he is captured. The Jedi Council launches a rescue, which triggers a series of events that culminate in the first battle of the Clone Wars. Super Battle Droid: bulkier and stronger than a battle droid, a super battle droid also has a built-in arm blaster. 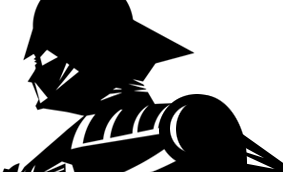 A hardened armored body-case reduces its vulnerability during combat. in all, it is a formidable opponent for anyone encountering it on the battlefield. STAPs: Single Trooper Aerial Platform (STAP) vehicles are used for reconaissance and patrol by battle droids. These lightweight crafts are armed with blaster cannons, so they can also be deployed as support vehicles for larger crafts, as they are during the Battle of Geonosis. Battle Droids: Battle droids swarm into combat on Geonosis, a vast army under the control of the Separatists. Armed with blaster rifles, the battle droids face the clone troopers in combat: two forces both programmed to act with unwavering loyalty toward their creators. Super Battle Droid is a repaint of 2007's TAC Super Battle Droid. 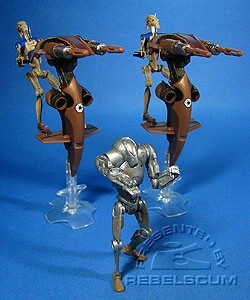 Battle Droid & STAP are repaints of 1999's EPISODE I STAP with Battle Droid. It should be noted that Battle Droid Pilots do not wear backpacks or fly STAPs.